Provide comfort for the family of Thelma Soya with a meaningful gesture of sympathy. Thelma L. Soya, age ninety six and a half, passed away on January 26, 2019 at Stoneridge Adult Foster Care. Thelma was born in Maple Grove Township, the daughter of George and Fern (Harding) Ball. Thelma graduated from Hastings High School in 1941. She was a 4-H leader for eighteen years in the Maple Grove and Banfield areas. 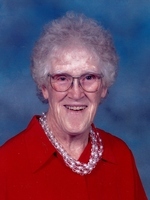 Thelma was a member of Country Chapel United Methodist Church. A homemaker, Thelma enjoyed spending time with her family, camping, reading, sewing, crafts, cake decorating, and flower gardening. Thelma was married to the love of her life, Rudolph Soya, for sixty one years before he preceded her in death in 2002. Thelma was also preceded in death by her parents, two brothers, four sisters, and son in law, Gary Bristol. Thelma is survived by son, Roland “Joe” (Evelyn) Soya; daughters: Lynell Scofield, Lynette Bristol, Carolyn (Clifford) McDonald; seven grandchildren, ten great grandchildren, and eight great great grandchildren. Thelma’s family will receive friends, Friday, February 1, 2019, 10:00 to 11:00 AM at Country Chapel United Methodist Church, where her funeral service will be conducted at 11:00 AM, Pastor Rick Foster, officiating. Burial will take place in Banfield Cemetery. Memorial contributions to Stoneridge Adult Foster Care or Country Chapel United Methodist Church will be appreciated. Please visit www.williamsgoresfuneral.com to share a memory or to leave a condolence message for Thelma’s family. To send flowers in memory of Thelma L. Soya, please visit our Heartfelt Sympathies Store. We encourage you to share your most beloved memories of Thelma here, so that the family and other loved ones can always see it. You can upload cherished photographs, or share your favorite stories, and can even comment on those shared by others. Provide comfort for the family of Thelma L. Soya by sending flowers.